Assembled Size: 27� L x 34"H x 18"W; Figure-only: 27"L x 16"H x 6"W.
Our exclusive Single Point Contact? 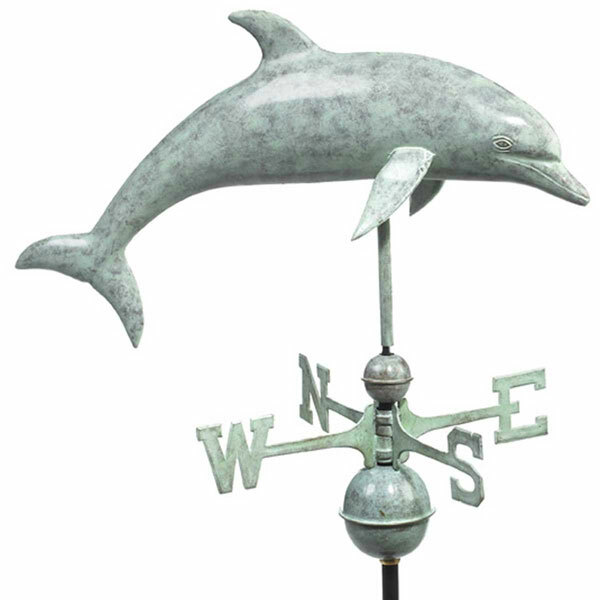 design allows our weathervanes to spin easily in the wind. The beautiful Blue Verde? Copper achieves the historic look of aged copper. This playful dolphin arches beautifully as it emerges from the sea to adorn the rooftop of your home, garage, cupola, barn or gazebo. For over 35 years Good Directions pure copper weathervanes have been unsurpassed in style, quality, and durability - perfect for the house-proud homeowner. Bring The Joy of Outdoor Living? to your home with this heirloom-quality piece.